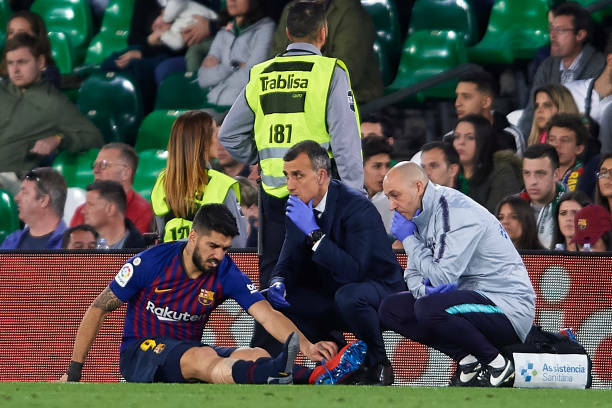 Barcelona striker Luis Suarez has suffered a sprained ankle and will be out for between 10 and 15 days while he recovers. The club confirmed on Monday via their official website. He was taken off in the closing stages of Sunday's 4-1 win over Real Betis. The former Liverpool man has been the team's top option at striker since his arrival in 2014. He has provided a steady stream of goals ever since and once again ranks among the Catalans' top scorers this season with 21 in all competitions. Even at the age of 32, Suarez remains an athletic marvel, and his vision and instincts in the opponent's half are top notch. He has a great understanding with Lionel Messi and functions well in Barcelona's possession-based system. The Blaugrana are fortunate in terms of the timing of the injury, as the international break means they're not in action again until March 30, against Espanyol. Should he fail to recover in time for that match, he'll target a return against Villarreal on April 2, where Barca will hope he can get up to speed ahead of their clash with Atletico Madrid four days later. While's he out, manager Ernesto Valverde could alter his formation a bit and go with a false-nine approach, with Messi or perhaps even Malcom moving into a central role.